My mother rang me from hospital today to let me know she just had her THIRD heart attack. I posted it on my facebook group and the wishes came flooding in. Already two videos on youtube and a big wall of comments. The Mum's the Witch Appreciation Society is my group where appreciation is the main key. It's a closed group but always looking for new members. Drop in and leave a request. CHANTREY'S CRAZY, FUN CONGA - Will YOU Win? My first ever debut of something I created musically. Cheryl sent a lovely gift to a fellow youtuber we're both subscribed to. 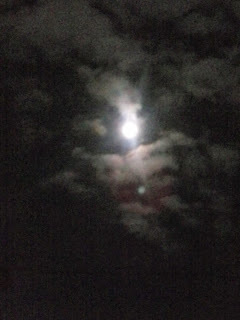 Darling Mother Moon, how I love to see in your fullness. Yet I cannot rest when you shine bright. I match your glow and shine within. Morpheus attempts to seduce me into slumber but I cannot dream for my dreaming is alive in Your energy. Keeping me conscious. All the while Eros sings his songs and I can only smile. dear Dear Lady, I pray I shall sleep soon before you sink into the horizon again. Lovely Cheryl, a true Texan Southern Belle and a very supportive lady blogged about me again and the gorgeous Gemma. Take momnent to read, please. The latest blog from the elder of my two younger sisters. Both of them blog. Proud of you both and love you! HELL NO! I WON'T G+ GO!